– for some mild thematic elements. When the titles of unnecessary sequels come to mind, it wouldn’t be too far-fetched to imagine Dolphin Tale 2 among them. While it was a surprise hit in 2011, it’s not one of those go-to movies when you want to watch something fun or uplifting, and it just didn’t have the stuff that iconic films are made of. And let’s face it, it didn’t really warrant a sequel. Dolphin Tale 2 picks up a few years after the conclusion of the first film, and it reunites the cast for another lap around the proverbial pool. 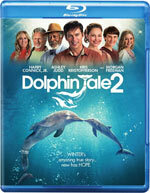 The 2011 movie was based on a true story, and Dolphin Tale 2 isn’t any different. It’s unusual for one movie inspired by true events to spawn a sequel, but for it to also be inspired by new adventures in the same true story, is quite a remarkable feat. Thankfully, Dolphin Tale 2 is NOT a rehash of the first movie (and that might just be its saving grace). It really does follow the story about three years later, and the young kids from the first film are growing up and starting to take on more serious roles at the Clearwater Marine Hospital. Because these stories are at least partly true to life, there is a sense of reality to them, however, the filmmakers, lead by director Charles Martin Smith, just can’t help themselves in injecting silly or cutesy material for the viewers to (hopefully) melt to. For example, in this sequel, a pelican named Rufus runs rampant around the hospital and ends up eating a visitor’s teddy bear out of her mother’s purse. For the rest of the film, the pelican follows around an injured sea turtle and then makes an appearance again during the final scene. It really makes the movie feel more like a Disney animated film than a live action story based on true events. By the time Rufus flies in for the last time, you half expect him to start talking–or singing. If you didn’t care for Dolphin Tale, the sequel isn’t a whole lot different tonally. It is a different story, putting the group’s caregiving of the injured dolphin Winter in jeopardy when her fellow dolphin companion Panama suddenly dies (and we see her lying lifeless on the bottom of the pool). Meanwhile, Sawyer is invited to be a part of a Semester at Sea program by a professor that would take him away from the gang for three months. He doesn’t want to leave his friends or Winter in her fragile state, but everyone thinks he should take advantage of this grand opportunity. The theme of Tale 2 ends up leaning heavily on the idea of change and its intense affect on our lives. And with Winter struggling with loss, the stress is on Clay to help Winter, or prepare to let her be transferred to another facility, which causes tension with his daughter Hazel, who is also struggling with her dad’s decisions and her role at the hospital. Overall, it’s a lot of drama, but the first film seemed to have plenty of it as well. The content is pretty tame. There’s some heavy material involving the death of the dolphin Panama, the depression that envelopes Winter and the rest of her human companions because of it, and the possibility of the group losing Winter to another caretaker. 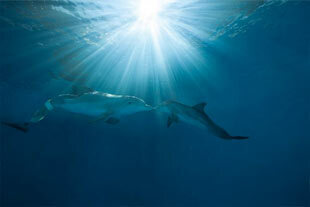 The movie tries to be a bit whimsical at times, but it seems you may have to be more readily attached to the characters–or have such a deep love for dolphins perhaps–to really get caught up in it. There’s no profanity and no inappropriate content; the only things to be prepared for are the thematical elements that involve death, mourning, and recovery. Personally, I haven’t been too keen on the Dolphin Tale films, but they’re pretty harmless and, for the most part, well-made family films. However, while it can be said for most movies, these dolphin tales are not for everyone, and only enthusiastic fans of the original entry should not pass on this follow-up. Dolphin Tale 2: Underwater Magic (3:03) – The first in a series of short featurettes is about revisiting the story from the first film and filming with new technology for capturing more captivating underwater footage. Look Who’s Running the Show (3:20) focuses on the kids growing up and changes in their roles from the first story to this one. Bethany Hamilton Meets Winter – (3:18) – The subject of the movie Soul Surfer, famed surfer Bethany Hamilton, makes an appearance as herself in this movie. She talks about meeting Winter the dolphin and getting her feet wet with acting by playing herself. Dolphin Tale 2: The Mission (3:34) talks about the goal of the hospital and its mission to rescue, rehabilitate and release. Dolphin Tale 2: True Story (4:01) – This one addresses the fact that this sequel is a true story, which is not only unusual for a sequel, but also unusual to even have a sequel to a true story in the first place. Cozi Zuehlsdorff “Brave Souls” (4:25) – So apparently the young actress who plays Hazel actually sings, too. (Who knew?) This video has her talking about writing a song for the movie and then shows her performing it for a music video. Gavin Degraw “You Got Me” (3:53) is another music video for the movie. Blooper Reel (7:22) – It’s obvious everyone had fun making this movie, and we see some great line goofs as well as the cast and crew just being silly on set. Highlights include Rufus the pelican trying to eat the animatronic turtle used for the movie… and Harry Connick’s spot-on Morgan Freeman voice impression. Blood/Gore: Winter accidentally nails Sawyer in the head with her body. He has abrasions on his cheek and lip. Violence: In the opening scene, a woman is thrown back by a panicking dolphin’s tail; It’s played for laughs, but a pelican attacks a woman and eats a little girl’s plush bear from her purse; We see a dead dolphin lying on the bottom of the pool; Winter accidentally nails Sawyer in the head with her body. He has abrasions on his cheek and lip; Hope zips around Winter in fast motions in a panicked state.